Ever wondered what its like to go on a London Spy Tour? Today we learn more about the Intelligence Trail’s London Spy Tours. Spy Tours are becoming very popular with spy aficionados, both with those who enjoy the fictional spy books of James Bond or Tom Clancy right through to impressive non fiction spy writing from the likes of Nigel West and Ben MacIntyre. The German Spy Museum in Berlin, Spybrary Approved! 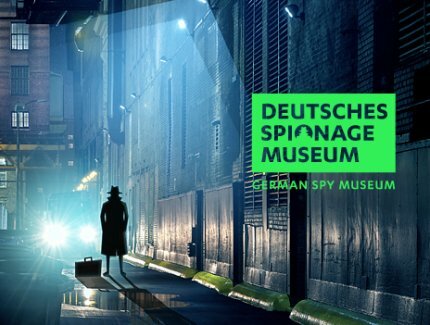 Spy museums are also becoming popular, the two that immediately spring to mind are the German Spy Museum in Berlin and our friends at the International Spy Museum in Washington DC. (Both come highly Spybrary recommended.) Next year NYC joins the spy tour fray with Spyscape but more on that in another episode. 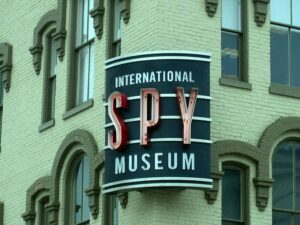 The International Spy Museum in Washington DC, Spybrary Approved! 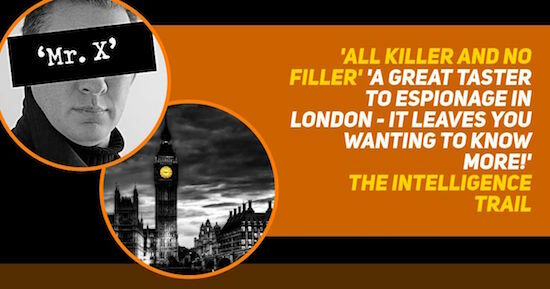 ‘The ‘Trail offers the most comprehensive content-rich introduction to the shadow world of Britain’s main intelligence services – MI5, MI6, and GCHQ – on the streets of London, in key locations associated with the spy world throughout the decades. Brian shares with us the spy books that got him interested in espionage, spying and the security services. How does Brian respond when he ask him if he has worked for the intelligence services? Brian gives us the lowdown on all his London Spy Tours including The Classic Tour, The Early Years Tour, The Cold War Tour and the Sexpionage Tour. He reveals why his ‘Mayfair and Mother Russia’ tour is his most hard-core London Spy Tour yet! Brian Gray tells us what inspired to him to start up the Intelligence Trail spy tour. He shares with us which celebrities have enjoyed his London Spy Tour and what famous people have ‘tour-bombed’ the Trail. And Much Much More…so much more that we had to split the interview into two parts! Brian will be back to share with us his thoughts on the challenges facing MI5 and MI6. Shane cheekily asks him what he would do if he locked Brian in a room with Kim Philby or George Blake. Stay tuned for that one.! Recently, Spybrary assembled a crack team of spy fans to check out Brian’s London Spy Tour. This elite team included Jeff Quest (Spywrite,) Gary Dexter, Ian Sanders (Manchester Military History Society), Rob Mallows (The Deighton Dossier), Tom (Literary 007) and Spybrary host Shane Whaley. They all gave the Intelligence Trail 5 stars and agree that Brian’s London Spy Tours are all killer and no filler. Check out the Tripadvisor reviews if you are intrigued and interested in going on the tour. 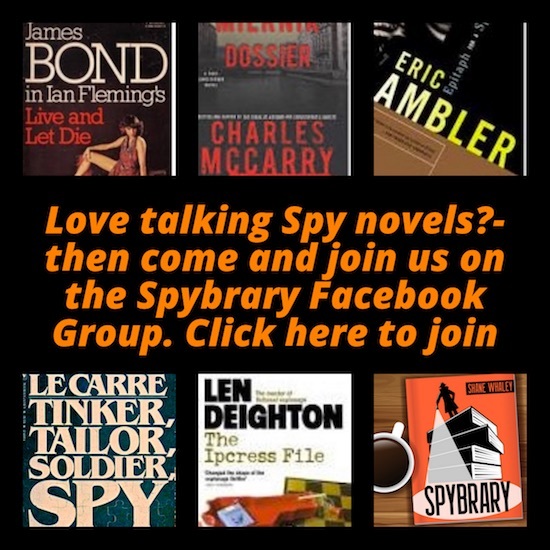 If you enjoy chatting spy books and spy movies, or have a question or point of interest on London Spy Tours come and join our private Spybrary Facebook Group. Shane I have become an avid Spybraran over the past few months. Very much appreciate learning about many authors i’d never been aware of before. Providing links to so many of the references from each podcast is a real service. My questions: 1) did I miss part 2 of the Brian Gray interview? I listened to part 1 again today and am primed for part 2 but don’t see it in the podcasts available; 2) have you interviewed or would you consider interviewing Ben Macintyre who has written so many fascinating non-fiction books? He was a very good interview in a short 2013 episode of BBC 4’s Book Club.